Janelle Maiocco’s blog, Talk of Tomatoes, has become an excuse for her to follow all of her food curiosities, a reason to push herself to learn home-canning, and ultimately was the impetus for her to go to culinary school. She “oozes happiness” at the thought of having a huge urban garden, and has been known to wield knives, pitchforks, and the occasional martini. You can also catch up with her on Facebook and Twitter. When Andrew asked me to contribute a post, I kept bouncing ideas off of him. Shall I write about my urban farm? Backyard to table? Healthy snacks? My struggle coming home from being abroad (or shall I say: My stomach’s rejection to a lot of U.S. foods)? Unprocessed to me increasingly means: Do my own processing. Or maybe “self-process.” It gives me more control, reduces unnatural or bad-for-you preservatives and pulls me into each season. You can process with home-canning, process your own grains, and reach toward making things from scratch. I find some choices are small and easy, and others more time-consuming and deliberate. One of the simplest choices is to skip the boxes and buy in bulk. The week of Oct.16 – 22 is National Bulk Foods Week. Who knew? Because of my new unprocessed lens, I took time to browse the Bulk is Green Council Site. Rice. Don’t spend too much buying rice! If you buy it in a canister it will cost too much. I refill quart jars with bulk arborio and make vanilla rice pudding and risotto weekly. Spices, Dried Herbs, and Vanilla Beans. Many people don’t realize that buying bulk spices is less expensive than buying in those tiny little overpriced jars. 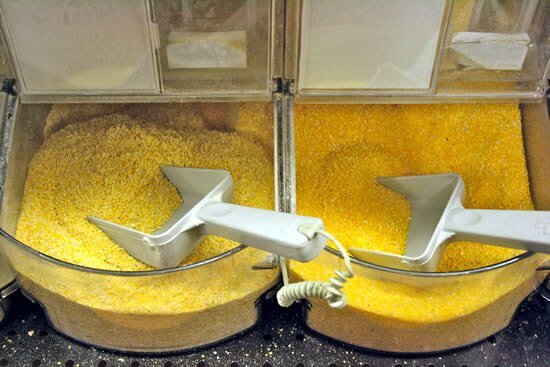 Corn Meal. Make your own polenta at home! 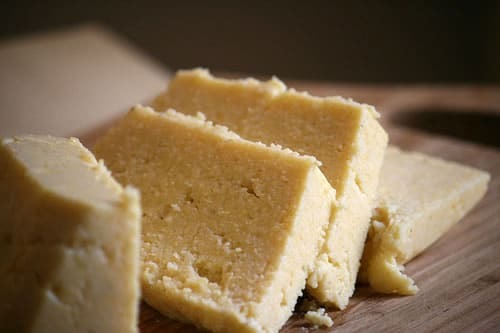 Here is a fantastic recipe for DIY polenta — and here are five things to do with leftover polenta. This is the classic recipe for polenta and will give you a fantastic product! In a saucepan, bring stock and cream to a simmer. Vigorously whisk in corn meal. Lower heat and stir frequently for 10-15 minutes until corn meal softens (taste it!). You may need to stir in extra stock to achieve your desired soft-or-firm consistency (I use a wooden spoon). Remove from heat and stir in Butter and Parmesan. Adjust seasoning with salt and coarse pepper (white pepper won’t make black specks). Serve immediately… or plunk into a tray to firm up for shapes the next day. I wish someone would do a starter list of things to buy in bulk to cover recipes for us newbies. I get to the whole foods market (a days drive away) and I get overwhelmed. Jo: BRILLIANT idea! I can do a roundup of ‘bulk ideas’ in NOV. Start small: just a few items. Maybe look bulk items up online before going to Whole Foods? Look up: arborio, couscous, a few diff. kinds of grains and flours, lentils. Then you will have ‘recipes’ going into your shopping trip! Esp. since it is such a long drive! Hah! Good start is and thanks for listing all your contributors nicely on the side. First thing I bought in bulk was glass containers to hold the bulk food in! I have removed as much plastic from my kitchen as possible at this point. Susan: Isn’t it such a feel good? I found huge jars at a garage sale this weekend and in went: cereal, arborio, sugar… well done! Jean: Thank you thank you! Huge and important point!! We love Bobs!! 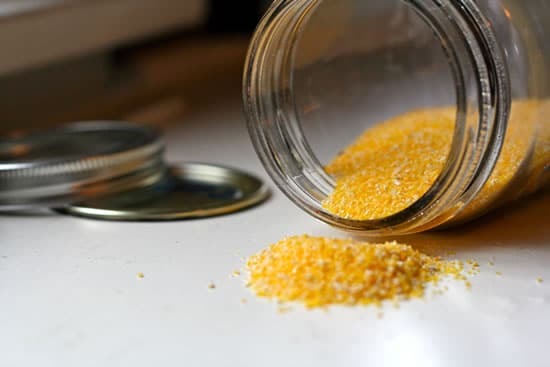 If #25 pounds seems like a lot: consider ‘group buying’ with friends and/or store in a number of containers: polenta, grains et al will last for years if properly stored.